Tipsy Tuesday – Facebook Missing Posts? Here’s Why…. 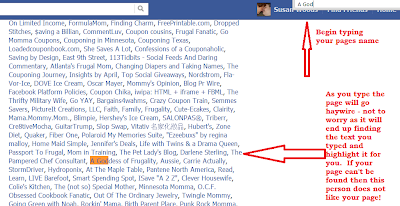 Is your wall on Facebook missing posts that you normally see from your favorite bloggers? Other Pages? Facebook is at it again! Is your wall on Facebook missing posts that you used to see? Here’s why – now you need to subscribe to ‘Interests’ to keep seeing those posts. If you don’t, you’ll miss out on giveaways, tips and lots of fun from your favorite deal bloggers, special needs bloggers – any blogger – says Facebook! Verifying winners of your giveaways can be a daunting task on Facebook. There is one easy way of doing so – providing the fan has their Facebook settings set to where one can see their interests on their info page. ***For purposes of this tutorial, I am going to pretend I am A Goddess of Frugality looking to verify Susan Woods as a fan of A Goddess of Frugality’s Facebook page. 1. Go to the person’s Facebook page you are looking to verify as a fan of your’s. Click on the ‘Info’ tab. 3. Now you want to pull up a search box. To do this – hold down the keyboard ‘Ctrl’ key while pressing the ‘F’ key. 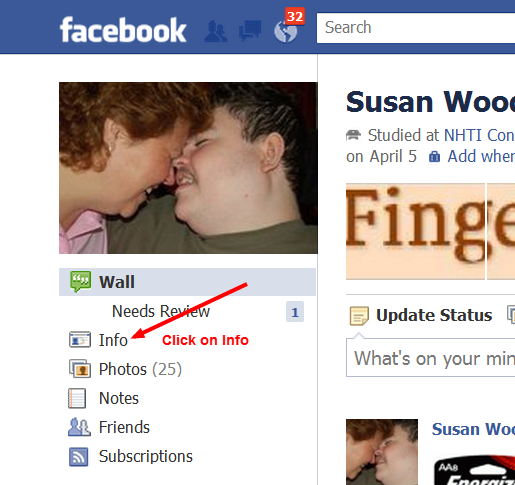 The search box will appear at the top right of your page (see picture above). 4. In the search box – begin typing the name of your page. As you start typing, the page may seem like it’s going haywire but it’s actually doing what you want it to do. Keep typing 3/4/5 letters of your page’s name (if you want to enter your entire page’s name…that is fine too). The next thing you will know – if this person is a fan of yours, your page name will be highlighted with the text you’ve entered in the search box. If you don’t pull up your page name then that person is NOT a fan of your page! That’s it. If you have any questions or get stuck along the lines of trying this – by all means contact me and I will help you the best I can.